Professional golf practice mats that will not fade, bunch up, weather or leave any stains or marks on your clubs. The pile height of the grass blades are 1 1/4″ high. No need for a rubber tee that grips your clubs as it makes contact, the mats are so dense a real tee can be used. Our Golf Practice Mats are 1 1/4″ Polypropylene product that will hold a real tee while allowing iron shots right off the surface. It allows for hitting practice year round and will also, save your grass and lots of time and money in turf repairs. Product can easily be rolled up for storage or transportation. Recreate the quiet, peaceful moments on the back nine with these premium golf practice mats from Custom Turf Outlet that ships free to your door. Available in four pre-cut sizes, these hitting mats give a realistic footing for a true swing practice. The lightweight material boasts durability and longevity for years of use. The thick and dense turf provides the choice to swing off a real tee or from the surface for iron shots, therefore expanding the advantages of premium quality artificial turf. 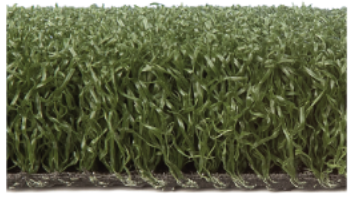 Practice in various fairway slope conditions by simply placing the golf practice mat over a contoured terrain. Relaxation is joined by the added benefit of low impact exercise as golf demands precision and finesse. Durable enough for the driving ranges and also, affordable enough for a homeowner to practice hitting balls as often as possible. This product brings the opportunity to replicate a real fairway and tee box, swing. 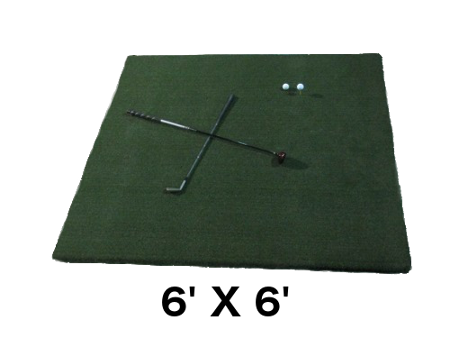 These golf practice mats will accept any real tee, while allowing you to choose different clubs and different size tees. According to Golf Digest, practicing off rubber tees, then playing on real tees can form bad habits. 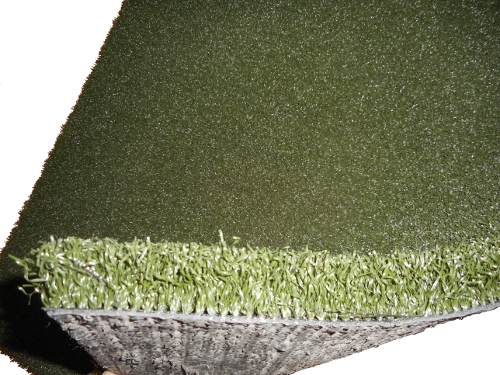 Improve your golf swing with the most realistic golf mat in the industry. Use any size real tees. Hit right off turf for iron shots. Hit down and through the ball that simulates natural grass. Take divot shots, without any bouncing. I was pleasantly surprised by the quality of this mat. I needed a mat that was thick enough to absorb a fast iron strike, but flexible enough to be rolled up. I watched a video in which Jack Nicklaus recommended “100 swings a day.” This mat can take a beating, without wearing it down and works great in my garage. Today, my wife took a few swings before breakfast, too! For the money, this mat is tough to beat! Much better than the competitors product on Amazon! Love the large size so you can stand on the mat and hit off it for a level lie. I hit irons off the mat and no chunks or fraying so far. We will see how it holds up, I’ve had it for 3 months so far. Love it so far. Use it in my basement in the winter, then I’ll take it out to my garage in the summer. What a great mat! Definitely a great buy for the price. I made the mistake of buying one of those little cheapo mats and it was done for within 2 weeks. Plus, I like a mat I can stand on. I use this thing at least 3 times a week in the garage and it is still going strong. Would deffinatley recommend this for hitting off concrete and for someone looking to use it a lot. Love this mat! Plenty big to stand on comfortably and even hit the BIG DRIVERS And dense enough for irons shots. Great value for the money compared to other “affordable” options, last only last 3 months if you’re lucky. Probably won’t need another one for a long time but I would buy another for my cottage. This mat was shipped quickly. Size is perfect for what I need. The turf bristles are very durable and doesn’t seem like it will wear out. It’s think and padded, when I hit behind the ball with an iron it cushions the blow well, even when I’ve got the mat on my garage floor. Sometimes I use the mat outdoors on the lawn and hit into my net. When I use the mat on my garage floor it moves around a little when swinging. Not enough to really bother the swing, but after 20 swings or so you can tell it’s moved a few inches and I have to move it back.I’m going to try putting a rubber bath mat under it and see if that helps. Mat rolls up easily for storage. I roll mine up and stand it in a 5 gallon bucket and leave it in a corner of the garage. Overall I’m very satisfied with the this golf mat. I’ve hit a large bucket of balls a day for a month and there is no visible sign of wear. We built a little putting range in our backyard and then, decided to add a driving range net. We first thought the grass would be enough and quickly realized that we needed a bigger, more solid space, so we ordered the 6′ x 8′ mat. It has been outside all summer, used 100’s of times and still looks brand new. 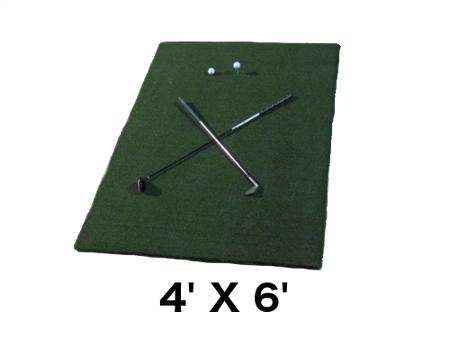 We were looking for a practice mat that would allow a real tee, so we could replicate real shoots out on the course. My daughter loves it! Perfect for both a 5′ 2″ girl and a 6′ 3″ man. This golf practice mat is awesome! Love this thing! More than enough room to stand on comfortably and even hit the BIG WOODS! Perfect for for irons too. Great value for the money. I’ve gone through many of the cheap mats and nothing beats a “pro” quality mat. Probably won’t need another one for a long time but I would buy this again if needed. This golf mat works perfect for me and I must admit that I am really impressed with the quality. It is thick and dense and well built and I think that it will last for many years. I use it daily and cannot be happier with it. Purchase with confidence! I am happily surprised by the quality of this mat. I wanted a mat that was thick enough to absorb a short iron strike,but convenient enough to be rolled up, and stored in my garage. I watched a video in which Arnold Palmer recommends “100 swings a day.” This mat makes that challenge easily done in our garage. Today, my wife took a few swings before breakfast, too! For the quality and durability, this mat is tough to beat! Nice feel. Can hit chip shots and drivers. I dug an area in the lawn so it lays flush and is situated in front of my driving net. I use it constantly and it works great. Can’t beat the quality and don’t think I will need to replace for a long time. Ive probably taken 1,000 swings on this practice mat since buying (plus the kids hit off it too) it has held up extremely well. I couldn’t imagine replacing this mat anytime soon. If you are looking for a quality pro mat to practice your swing on, I would highly recommend this one.